Over at the Broken Twig blog, news of resignations and a retirement has been posted via an email about the senior leadership of Moody Bible Institute. The email from the student development office also has been posted several places around the web by now, and I have it here below. In short, the Moody Board of Trustees has accepted the resignations of president Paul Nyquist and chief operating officer, Steve Mogck; and the retirement of provost Junias Venugopal. This news follows the firing on Monday of Moody radio personality Julie Roys after she after she raised concerns about various financial and personnel issues at the Bible college. On behalf of the Board of Truste​es, let me thank you for your service to Christ, your dedication to Moody Bible Institute, and commitment to be in prayer for the ministry at this time. We often refer to the Moody family, which is how we see all of you. We apologize for coming to you so late in the day, but given the nature of the news we are sharing, we felt it best to communicate with you as soon as possible. As you know, the Board of Trustees has been discussing issues related to widespread concerns over the direction of Moody. Today, we accepted the resignations of President, Dr. Paul Nyquist; Chief Operating Officer, Steve Mogck; and the retirement of Provost, Dr. Junias Venugopal. Let there be no mistake that the Board of Trustees holds these three men in high regard for their ethical, moral, and spiritual leadership. They are godly, honorable men to whom we entrust to the Lord and offer our deep gratitude for their years of faithful service to Christ and to Moody. However, we are unanimous in our decision that it is time for a new season of leadership. I ask that you be in prayer for them and their families. While we begin to develop plans for a nationwide search and prayerfully seek the Lord’s direction for these important positions, we are encouraged that the Lord has provided a strong leadership team to step into these roles in the interim. Greg Thornton, Senior Vice President of Media, will serve as Interim President during our search. Mark Wagner, a member of our Board, who is former president of, and now a consultant to, Walgreen’s, will serve as Interim Chief Operating Officer. In addition, Dr. John Jelinek, Vice President and Dean of Moody Theological Seminary, will serve as Interim Provost. Understandably, there are many questions at this time. Please know that we are working diligently through everything, and will stay in regular contact with you first, our Moody family, and with our many partners and friends as well. I ask for your prayers for the Board, our interim leadership team, and the entire Moody community during this next season. God has been faithful to Moody since 1886, and we continue to seek His favor as we move forward. 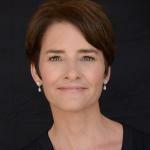 For background on the controversies at Moody, see this post from yesterday, Julie Roys blog, and the Broken Twig blog. I have reached out to Moody Bible Institute and Moody Radio Network without response to messages and voice mails. This looks like a lawsuit. 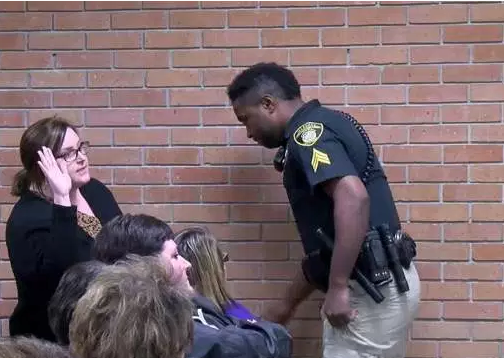 If this is what it looks like in the video below, I hope Deyshia Hargrave gets some of that long overdue pay raise in a financial settlement. 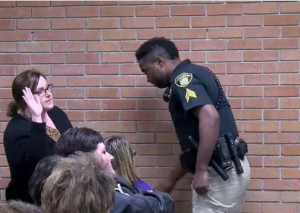 According to many news services (source), Kaplan, LA middle school teacher Deyshia Hargrave questioned why her superintendent got a raise when teachers in the district had gone without a permanent raise for 10 years. Ms. Hargrave, after spending all day putting up with middle school kids, wasn’t having any of that nonsense, so she said her feelings. That didn’t work out, as the video below shows. The most complete report I have seen of this incident and the aftermath of it is at Heavy.com. She was booked but then released. The prosecutor does not plan a case against her and the teacher’s union and ACLU have issued statements and are following the matter. The school board president Anthony Fontana is defiant and thinks she got what was coming to her. Amazing. The board president and superintendent seem to like their position, but they don’t have many supporters according to the Heavy.com report. There is a petition with nearly 3000 signers at present who stand in support of Hargrave and she is considering a lawsuit. As a son of a school administrator, my initial reaction is that this duo is out of touch with their constituents. I cannot imagine giving the superintendent a raise while the teachers have gone without one for a decade. That action does communicate that the board doesn’t care about the staff. I hope this teacher’s stand will lead to some positive action for her, her colleagues and the students in the district. Julie Roys, host of the Moody Radio show Up for Debate, was terminated from her radio show yesterday after she alleged the existence of questionable fiscal and employment practices at Moody Bible Institute. Roys’ disclosures include a loan nine years ago from MBI to the school’s president Paul Nyquist for a condo (source). According to Roys, that loan has not been repaid. She also details alleged irregularities with college facilities, gambling by a board trustee, heavy handed tactics with faculty and much more (source, source). According to her post today, in the midst of these revelations, she was fired from her job. I reached out to Roys and she repeated the quote above which came directly from her email from MBI’s Greg Thornton. A voice mail was left with Moody Radio’s public relations office. Julie Roys – From Roys Twitter page. on the show before and I found her to be fair in moderating the guests and callers. In my view, talk radio is often a waste of time with people shouting over each other with loads of misinformation. However, in my limited experience on her show, it seemed to me that she sought to provide a place for different points of view to be heard. I especially enjoyed the conversation about the Johnson Amendment back in April, 2017. In any case, I suspect that — as often happens — MBI will find that firing an employee who is asking questions will not make those questions disappear. You were all made aware last Friday that a number of accusations have been made against Moody’s leadership including members of our executive team, Board of Trustees, staff, and faculty. As we continue to pray and seek resolution to these allegations, we are committed to keeping you informed about this matter and how we are proceeding. First, please know that we are deeply grieved and disappointed over these allegations, have taken them very seriously, and are consistently prayerful before the Lord. We’re reviewing each of the issues raised and determining how it was addressed in the past, what we need to do in the present, and lessons learned for the future. And while interest and concern about specific details regarding personnel-related matters has been voiced, we will not violate the privacy of those involved, nor debate these issues through a third-party outlet. That is not helpful to the process, nor is it honoring to the Lord as His children. In addition to last week’s meeting of the Board’s Executive Committee where these issues were discussed at length, the full Board of Trustees will deliberate further on Wednesday, January 10. We covet your prayer for that meeting, and when more information is available, we will inform you, our Moody community, first. As we press forward, despite the challenges and hard conversations that are taking place at Moody, our executive team and the Board of Trustees are unified in our love for the Lord and this great institution, the pursuit of truth, and seeking reconciliation where possible. With that, we have also come to recognize the need for, and are committed to, improving our culture and climate at Moody through greater transparency, frequent, concise and timely communication. Please continue to be in prayer for Moody, our leadership, and each other that we would reflect the unity of one body joined together by Christ as expressed in Ephesians 2. Moody has faced and overcome numerous challenges throughout the course of our 132-year history. We must not forget that ceaseless prayers and God’s guidance are how we’ve been effective in ministry for so many years in a rapidly changing world, and that He continues to bless us with the incredible privilege of equipping people in the Word of God. Thank you for your commitment to prayer and seeing God glorified through this. We will continue to be in prayer for you as well. Life Christian University claims to provide earned degrees to “distinguished degree holders” who get PhDs based on their written works and ministry experience. At least some of those people portray them as earned academic degrees. 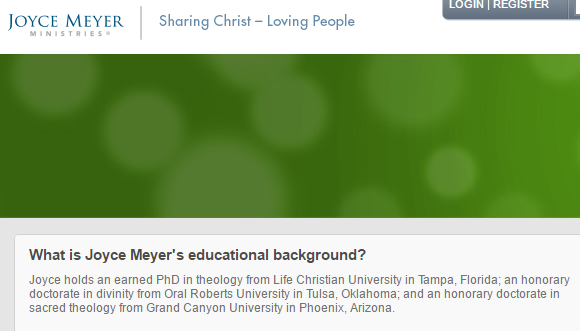 Joyce Meyer is one of those degree holders. Given what LCU says about the degrees on the school website and what founder and president Douglas Wingate said recently in a television interview, Meyer didn’t attend LCU and was given the degree without doing doctoral studies. Unlawful use false or misleading degree, when–violation, penalty. (2) A degree from any institution of higher education in a false or misleading manner, regardless of whether that institution is located in Missouri and regardless of whether the institution has been issued a certificate of approval or temporary certificate of approval by the board. (3) Is awarded, bestowed, conferred, given, granted, conveyed, or sold in violation of this chapter. 3. The penalty for a violation of this section shall be a class C misdemeanor. 4. For purposes of this section, the term “board” shall mean the coordinating board for higher education. A degree is false and misleading if a person claims an earned doctorate but did not complete a program of study. According to Wingate, Meyer and her fellow degree holders didn’t attend LCU but got an “earned PhD” in consideration for their “published works, along with their lifetime ministry achievements.” Meyer implies she earned it and graduated. Since her ministry is her occupation and business, I suspect this law applies to her and the other distinguished degree holders in MO (Billye Brim and Larry Ollison). The remedy is easy. Just stop referring to the degree as earned. What LCU has done is award honorary degrees and they are allowed to do so, but, in some states, the recipients of those degrees aren’t allowed to deceive the public with them. Missouri is one of those states. When I contacted the MO Department of Higher Education, a spokesperson told me that the Department does not have investigative or enforcement authority related to this statute. Instead, she said complaints could be directed to the Attorney General’s office. A spokesperson for the AG’s office confirmed that a consumer complaint begins the process of investigation and enforcement. The King’s University is a ministry training school founded by preacher Jack Hayford and later moved to Southlake, TX to be housed at Robert Morris’ Gateway Church. In May, I reported that TKU was losing students and considering the closure of several branch campuses around the country. Nonetheless, Morris and the school leadership continue to promote the school. TKU is not regionally accredited but rather boasts accreditation by the Transnational Association of Christian Colleges and Schools. Although credits from TKU may not transfer to regionally accredited schools (e.g., University of Texas, Grove City College), they are accepted by other TRACS accredited schools. Charis Bible College is an unaccredited school also set up to train ministers. However, recently David Barton has been instrumental in helping to start a School of Government at Charis. Thus, Charis is setting sights on training people to go into politics. A part of that vision is a recent articulation agreement between TKU and CBC for the transfer of credits from CBC to TKU. This means that a student can take courses at unaccredited Charis and transfer them to accredited TKU. This agreement with Charis greatly enhances the value of the Charis credits. To me, this seems like an end around accreditation for Charis Bible College. The leaders of that school have even less incentive to become accredited because their students can simply transfer them to TKU where they will become a part of an accredited degree program. From there, a student could transfer credits to another TRACS school. I asked TRACS about their rules concerning transfer of credits. While no one has answered as yet, I did find these criteria to help guide credit transfer arrangements. Note letter b and c. Letter b requires the quality of course to be comparable between schools. 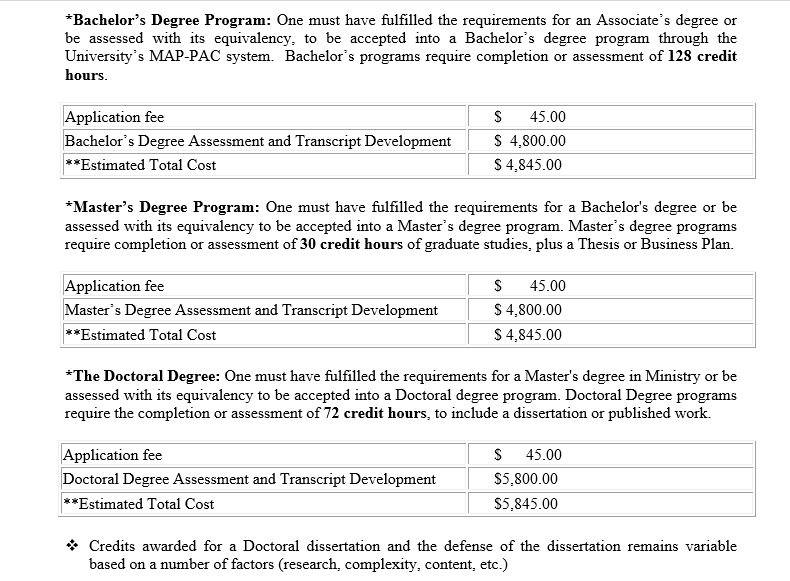 TRACS guidelines require those teaching BA students to have a masters degree. Very few of Charis faculty have masters degrees. David Barton claims to have an earned doctorate but on examination, it appears that his doctorate is from diploma mill, Life Christian University. Charis’ agreement with TKU all of a sudden makes Barton’s use of a degree based solely on life experience even more relevant. While technically true because TKU is accredited by TRACS, it is still misleading if it is not explained that TRACS is not considered comparable to regional accreditation. Regional accreditation is what opens up wide spread transfer of credits from school to school. Texas schools are evaluated by The Southern Association of Colleges and Schools Commission on Colleges. In practice, this often limits opportunities for students. For instance, a TKU student with a degree in Christian counseling may find that graduate schools will not accept it as a non-regionally accredited degree. When TKU and Charis promotional materials declare TKU accredited, I fear that some students will misunderstand and make future decisions on inadequate information. Yesterday on his Wallbuilders Live show, David Barton said the sports program at Oral Roberts University in the 1970s was “where the drug culture was” and was filled with sexual promiscuity and illegal activities. 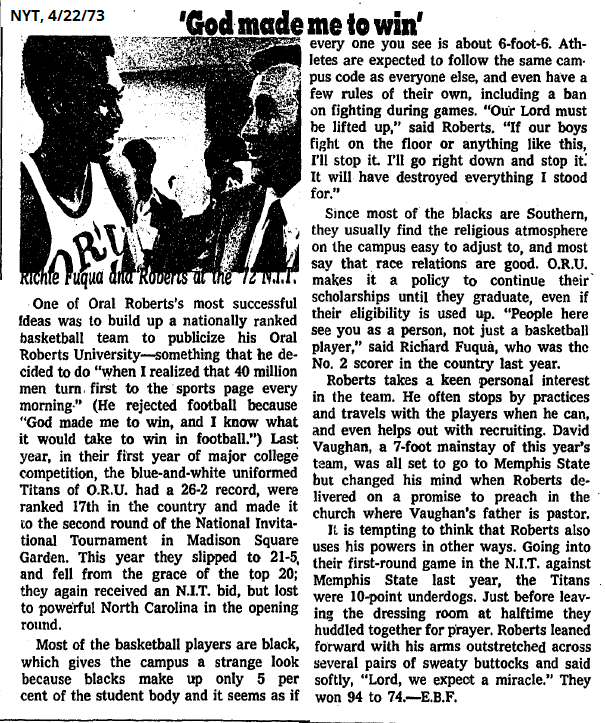 Listen again to his defamation of the ORU basketball program in the 1970s. In an earlier part of the show, Oklahoma Wesleyan University president Everett Piper said the sports programs should be aligned with the rest of the college mission. In response, at 34 seconds into the above segment, David Barton began talking about “the school I attended.” Barton attended Oral Roberts University and said his program was different than Piper’s. But the school where I attended, when I attended there that was not their thing. Their thing was to have the best program ever. So even though I went to a religious school, it was not about faith and character, it was about how high you were in the nation. So in basketball, talking before with the team there and what we did, and we made it to the Elite Eight in the tournament, but the character was so bad that, that’s a period I remember very clearly in my experience because in outing some things that were going on in the basketball team, that was where the drug culture was, that was where it was really promiscuous, that’s where a lot of illegal stuff, and outing that I ended getting death threats and I had to have cops carry me from class to class across campus because of the death threats on a Christian university, for outing things that violated the honor code that we all signed to go to the university. 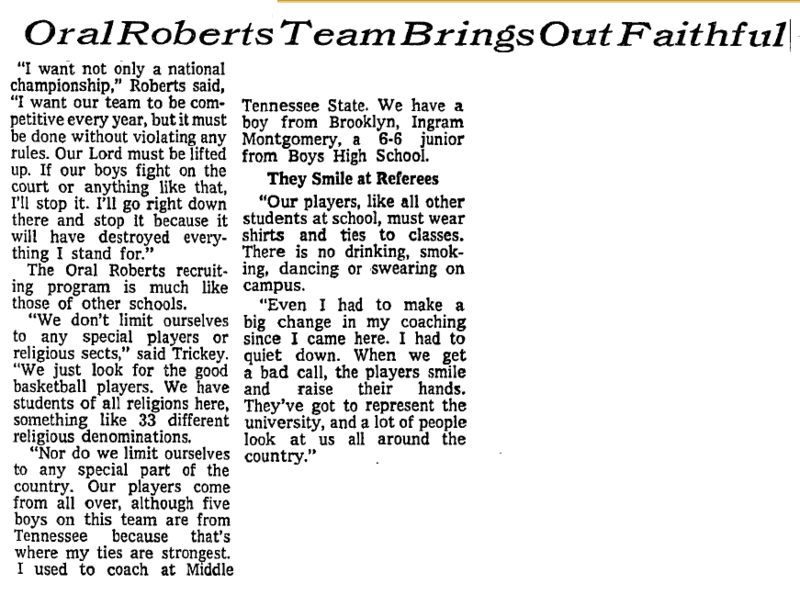 A 1972 NYT article points out that most of the basketball team was African-American and occasionally complained about the religious zeal of other students. However, there was no description of a different behavioral standard for the team. 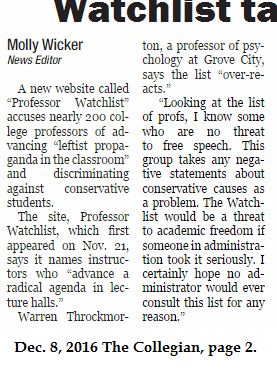 A 1973 article addressed both the code of conduct and the racial differences. I fully understand that Roberts assessment might not have been accurate but I can’t find any evidence of what Barton claimed either, especially as school policy. in connection with admission to any institution of higher education or in connection with any business, employment, occupation, profession, trade or public office. 2. Unless a greater penalty is provided by specific statute, a person who violates the provisions of this section is guilty of a misdemeanor and shall be punished by a fine of not more than $5,000 or by imprisonment in the county jail for not more than 6 months, or by both fine and imprisonment. 3. In addition to any criminal penalty imposed pursuant to subsection 2, a person who violates the provisions of this section is subject to a civil penalty in an amount not to exceed $5,000 for each violation. The Attorney General or any district attorney of this State may recover the penalty in a civil action brought in the name of the State of Nevada in any court of competent jurisdiction. (a) “Degree” has the meaning ascribed to it in NRS 394.620. (b) “Honorary degree” has the meaning ascribed to it in NRS 394.620. Joyce Meyer, David Barton and the other Life Christian University “distinguished degree holders” should be careful when in Nevada. According to Douglas Wingate, the PhDs given to “distinguished degree holders” are given solely in consideration of their life and ministry experience. Nevada forbids that kind of degree to be used in the state. If more than 10% of the work for a degree is based on life experience, it is considered “false or misleading.” Even honorary degrees cannot be portrayed as having been earned. Clearly, the definition of “earned degree” as used by LCU would be considered false and misleading in Nevada. I am compiling a list of states which penalize the improper use of degrees and applying those findings to some of “distinguished degree holders.” Stay tuned. Life Christian University is a school in Lutz, FL which awarded what school founder Douglas Wingate calls “earned degrees” to “big name” preachers who never attended the school. Benny Hinn, Joyce Meyer, Kenneth Copeland, and a host of other “distinguished degree holders” were given PhD degrees in recognition of their work. According to LCU, these degrees are earned. Additionally, LCU’s requirements for a bachelor’s degree are much lower than at an accredited school. LCU doesn’t match the state requirements on how many hours a person should attend classes to get a degree. LCU’s accreditation is with a group — Accreditation Commission International — that has a checkered past and allows LCU to simply add branch campuses without an accreditation visit. In fact, LCU switched to ACI for that reason. ACI is not recognized by the Department of Education as an acceptable accreditation body. LCU’s degrees require much less work for achievement of a bachelor’s than the law demands for a traditional bachelor’s. And as we have learned, some degree recipients have an “earned degree” for no work whatsoever. LCU’s accrediting body (ACI) is not recognized by the Secretary or any other entity named in the law. Let me be clear, LCU students do attend classes (3 hours/week). However, it would take about 12 years to get a degree at an accredited school while it only takes them 4 years and less if the degree is earned online. The PhD degrees to the distinguished degree holders are the main indicator of a diploma mill. These are given to people who don’t even attend the school. For more on LCU, read these posts. UPDATE: The state of Missouri responded to my complaint about Joyce Meyer’s fraudulent LCU degree. She has since started calling it an honorary degree.